Why waste the next-gen powerhouse in your pocket for task tracking when you can just recycle an old smartphone 8 Creative Ideas To Recycle Your Mobile Phone Without Throwing It Out 8 Creative Ideas To Recycle Your Mobile Phone Without Throwing It Out Recycle mobile phones. I wish that should be the catchphrase for all of us to live by. While researching this article, I came across quite a few official mobile industry websites of consumer rich countries... Read More and turn it into a dedicated chore tracker? Chorr is a free Android app that’s specifically designed for re-using old devices. The words on the tin say, “Give use to a retired Android and get motivated.” Velcro the device to the wall (recommended by the developer) and it becomes a central hub for tracking chores and tasks. It isn’t sentient, but all your chores will be there front and center once you stick the phone to the wall and plug it into a 24/7 power supply. 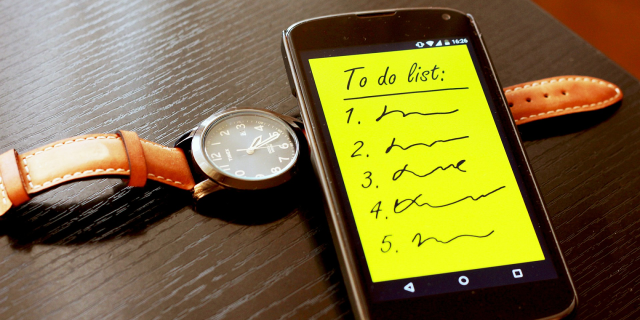 You will have one less excuse to forget chores or procrastinate tasks. The appeal of the app lies in its minimal design. The bold and large interface makes it easier to see everything from a distance. For this very reason, the elderly can also use it as a pill reminder and schedule tracker. To add a task, click on the Add button. You can also group similar tasks together. Select an icon and give yourself a score for completing the task at the end of the day. You can break down a task into smaller steps and add more information to each. The History tab records your achievements and shows you the list of completed and unfinished tasks. Chorr supports recurring tasks too. One of the more useful elements is the Score you can attach to a task. Use this element to “gamify” the to-do list and add some fun to the day. Maybe, you can attach rewards to the scores you set up. Negative scores are also a motivator for plotting your progress (or lack of it). Here’s an idea: Do you find it difficult to start a morning routine as a habit? Don’t add too many chores to the app. Just record the few habits you need to fine-tune for a productive morning routine. I have, and the progress is promising so far. If you just dismissed the idea of a morning routine, then use the app as a log to examine your day. It might reveal your preference for a few specific tasks over others. The ignored ones need to be attacked! Have you found a task tracker useful? Give us your best idea for “upcycling” an old smartphone.